David Gray today urged his team-mates to start hammering home their advantage at the top of the Championship by winning in Dumbarton this weekend - at the ground where title rivals Dundee United have been beaten twice this season. 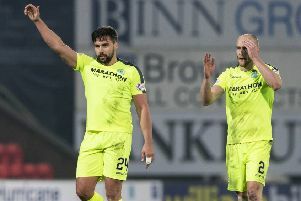 Hibs’ 3-0 victory over the Tannadice outfit last Friday opened up a four-point advantage for Neil Lennon’s players and while Gray is more than happy to be in pole position for the one automatic promotion place he is well aware of the pitfalls a visit to the Cheaper Insurance Direct Stadium can hold. Neil Lennon’s players will have to cope with the fact that they’ll be coming off a high of having demolished their closest challengers in front of a raucous 18,786 crowd to play at a ground which is open on three sides and where this season’s top gate remains the 1389 who saw a Jason Cummings penalty earn Hibs all three points in September. Recalling how Hibs themselves had suffered two defeats at Dumbarton last season, the 28-year-old said: “We’ve been in this league three seasons now and we know you can’t get too far ahead of yourself because anyone can beat anyone on their day. “Every single ground is difficult and we know what to expect at Dumbarton. It will be a tough game, conditions can play a part and, if the wind blows with that one stand they have, it can be a bit of a leveller. “Dumbarton aren’t going to win the title, but they are taking points off teams which might have an effect. They’ve beaten United twice at home and won against Falkirk, for instance, and, when you are regarded as the bigger club, everyone wants to beat you, to take your scalp. Having said that, Gray revealed he expects more twists and turns following a topsy-turvy spell in which Hibs and United have exchanged places at the top of the table, Ray McKinnon’s players having enjoyed an unbeaten run of 12 matches to overhaul the Capital side as they dropped points to Morton and Raith Rovers before suffering back-to-back defeats by Dumbarton and Hibs. The Hibs skipper said: “I’d rather be four points ahead than chasing but there are still so many points to play for. We could have gone six ahead had we won at Tannadice while only a couple of weeks ago people would have been saying United would be coming to Easter Road with the chance to go clear.